Note: The News Leader of Staunton, Virginia published an op-ed version of this piece on 8/15/2017. It can be found here. Dominion’s Atlantic Coast Pipeline (ACP), if allowed to be built, will be the largest disturbance of land and water in the Commonwealth of Virginia since the Interstate highways were built. Is it possible or even probable that Dominion can dig up a 600 mile long, ten foot deep, 125-foot wide swath through three states, crossing hundreds of streams and meet each state’s water quality standards? I do not believe it is possible nor probable. 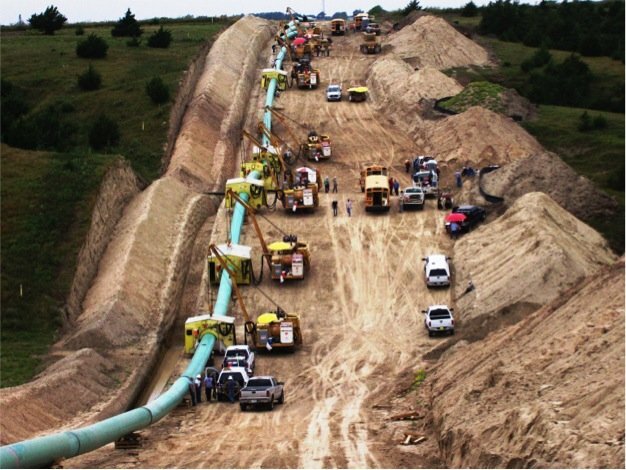 Natural gas pipeline construction in Nebraska. The ACP will unearth 9,090 acres (that’s about 9,090 football fields) of Virginia – 396 million square feet. That’s 15.6 times larger than the footprint of the largest office building on the planet – the Pentagon which covers 583 acres. The ACP in Virginia will be almost as long as Interstate 81 is in Virginia which is 325 miles long. Have you ever seen a construction site that did not have brown water leaving the site after a rain? I have not, even with the proper erosion and sediment control practices such as silt fences and catch basins. Runoff water from construction sites is brown because it has suspended soil particles in it. These soil particles clog the gills of aquatic animals suffocating them, they die. 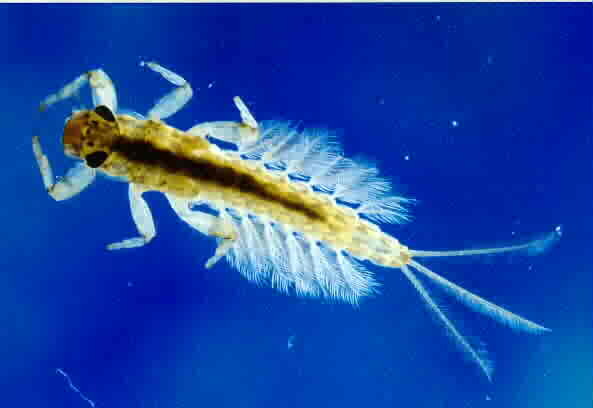 This Mayfly nymph lives in clean streams and has external gills. Sediment in streams clog their gills and kills them. How can any public body or any rational person believe this much earth moving and blasting will not pollute streams, destroy aquatic life, or disrupt the underground water supplies we depend on. The ACP’s planned mayhem of construction will go through the water recharge area of Gardner Spring which supplies the city of Staunton, population 24,000 with half of its water. The spring’s recharge area is in karst geology. How many water recharge areas will the 600-mile long mayhem of construction go through? How much aquatic life will this destroy? The DEQ states it will study every foot of upland disturbance created by the ACP. They should study, review and permit every stream and wetland crossing as well. But they are not. They plan to give this responsibility to the Army Corps of Engineers where Dominion hopes to receive a blanket permit for all stream and wetland crossings. The planned ACP will cross 189 streams and 43 wetlands in Augusta County alone. Farmers Have to Get a 401 Permit for a Cow to Cross a Stream, Shouldn’t Dominion? Farmers must get a permit for their cows to cross a stream. Shouldn’t Dominion be held to the same standard? Dominion needs a 401 permit from the Virginia State Water Control Board (SWCB) to build their Atlantic Coast Pipeline. The Board has the authority and the responsibility to certify that Dominion’s construction of the pipeline will not violate Virginia’s water quality standards. If they cannot certify that this mayhem of construction will not violate state water quality standards then the Board can and must deny the permit. Our water is too precious to gamble with. Let the SWCB hear your voice. And please tell them the comment period for this action is woefully too short. My good friend Ralph Bolgiano sent this comment to DEQ, he gave me permission to post it here. He is a former DEQ employee. My name is Ralph Bolgiano and I am a former employee of the Sate Water Control Board and the Virginia DEQ, Valley Region which included Bath, Augusta, and Nelson Counties. I was the Regional Biologist for about ten years. I also have some experience with EISs, erosion and sedimentation regulations, plans, and remediation of disturbed sites. More importantly than my familiarity with Bath, Augusta, and Nelson Counties, is the fact that I have walked the proposed route of the ACP up the west side of Jack Mt. in Bath County and my friend, a former environmental regulator, employed at the Maryland Department of the Environment, shared with me the details of FERC’s EIS and the plans that Dominion submitted to DEQ for the Atlantic Coast Pipeline. I can say with certainty that the procedures described in that document have no relation to reality with respect to the route up Jack Mountain. The route down the other side of Jack Mountain is about the same. There are seven or eight more mountains to traverse before the ACP even gets to Nelson County at the top of the Blue Ridge Mountains and the Skyline Drive. The document is riddled with incorrect routes, slopes, elevations, and assumptions (for example, no Karst geology in the area). The plan calls for a 125 to 150 foot wide clear zone, and a 30 foot wide by 25 foot deep trench to be blasted into the bed rock. After the pipe is laid, this trench is to be backfilled with soil (from where?). Filter fences are supposed to work on 60% slopes. The proposed route I walked, goes up a steep ridge (total elevation change more than 1,500 feet), that has BOTH of its sides sloping 60% down on right and left, where there is at least a wet weather stream, or a permanent stream below several limestone springs on both sides. The center of the ridge is 15 feet wide. The soil is less than two feet deep before bed rock is encountered. There are very similar ridges on both sides of the proposed route. This means that the central steep ridge will be replaced with what in effect will be a mile long 60% sloped foot ball field, aka, an urban gutter. Two times the present rain fall and run off will be channeled into this steeply sloping “gutter”. I won’t go into the biology of this at this point, you probably know that urban gutters (far less steep) do not harbor aquatic life, nor do they discharge water into their receiving streams in a manner conducive to sustainable aquatic systems, much less the trout in the Jackson River. In other words, there is no way that this can be done according to plan. Anyone who looks at this route will agree that the “protections” in the EIS are impossible to implement. The obvious conclusion is that they will be cutting all sorts of corners and willing to pay fines for damages that are 1 cent on the dollar of what doing the project according to plan would cost. Regardless of the “short term, temporary” impacts, the permanent realignment of the topography will result in a greatly compromised hydraulic system. It is a total joke. The part of the route that I saw was but a fraction of the 300 miles of Virginia that is “in the way” of the pipeline. Signing off on this project as being in compliance with the Clean Water Act is an abrogation of the goals, objectives, and mission of the VADEQ. You are empowered to enforce the law; do so. tour de force, bobby whitescarver. here’s to integrity. with gratitude. As humans contribute to their own extinction our remains will be the fossil fuel used by another species millions of years in the future. We need more voices to echo Bobby’s wisdom and research. Thanks for stopping in posting, Charlie. Thanks also for your kind words. “I have just read the decision of the Second Circuit Court of Appeals in Constitution Pipeline Company, LLC v. New York State Department of Environmental Conservation, No. 16-1568 (decided August 18, 2017). As you know, the court denied a petition for review of an order of the NYSDEC denying certification of a proposed pipeline in that state under §401 of the Clean Water Act. The court held that, in light of the DEC’s responsibility to the citizens of New York to protect the quality of the water in the state’s streams, the agency had the authority to insist the the pipeline company submit a detailed analysis of the impact of the pipeline on each proposed stream crossing, and it was reasonable for the DEC to deny the application when the pipeline company failed to provide sufficient information. The decision makes it clear that the Virginia Department of Environmental Quality, which has a similar responsibility to protect the quality of Virginia’s water, has the authority to demand similar information about stream crossings from Dominion. The question it raises is why hasn’t the DEQ scrutinized Dominion’s application in the way that the NYSDEC scrutinized the application from Constitution Pipeline. Aren’t we entitled to the same level of protection as the citizens of New York? The DEQ’s proposed certification without any meaningful review of the impact of the pipelines on our water quality stands in stark contrast to the careful approach of the NYSDEC. If it is finalized, it will be a great embarrassment to the DEQ and the Commonwealth of Virginia”. I can say from personal experience that putting in a pipeline is destructive to the surrounding area and pollutes all waterways in the area. There is a natural gas pipeline currently being put in through my hometown of Danbury, CT and it has caused major erosion and runoff problems. It crosses the major road to the only public high school in town, along with a major route from the suburban areas to the highway. With the pipeline construction going on, the roads are constantly covered in a thick layer of mud, traffic is backed up for miles, and the Still River, a major river that flows through Danbury, is physically darker from the runoff. There should definitely be some form of regulation regarding cleanup for the construction because it’s causing major hassles while being made and cannot be good for the environment. Gabby, thank you so much for bringing to light the facts about pipeline construction…we need to get your story out.